After having been away for 2 weeks, it was really good to be back in Rosario and get back to teaching the kids. Having never cared much for kids, I was surprised by how happy I felt to see them again, and how easy it was to slip back into my routine. Unfortunately, a welcome of another sort awaited me as well. I arrived to find practically the entire household down with some kind of flu, and within a day or two I got it as well. It wasn’t too serious – mainly just a sore throat – but I missed one day of school to recuperate. Shouting at the kids all day long isn’t great when you have a sore throat! Rosa made me limonada (very concentrated lime juice with a bit of cinnamon) – extremely sour but effective! I also had some naranjada (similar but with orange juice instead), which is sweeter but less effective, according to Rosa. As you probably already know, more than 90% of Ecuador’s population is Catholic. 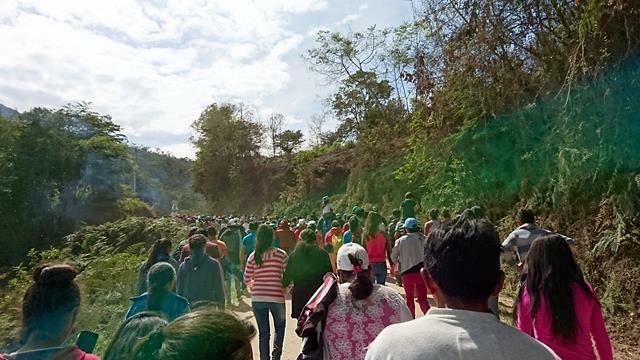 The day after I came back from Quito, there was a caminata (a sort of pilgrimage) from Rosario to Cuellaje in which everyone walked the 14km all the way to Cuellaje. Almost everyone went on foot, although there were some people on motorbikes and in other vehicles – generally the very young and the very old who wouldn’t have been able to walk that far. I decided to go as well despite not being Catholic, more out of curiosity than anything else as I wanted to find out how long it would take. It took about 4 hours, but that was only because everyone walked really slowly. I was getting rather impatient towards the end because I just wanted to reach Cuellaje as soon as possible, but a statue of the Virgin Mary was at the head of the procession so the people carrying the statue were the ones setting the pace. Along the way, everyone was encouraged to sing hymns or pray or just walk in silence and meditate, but in practice it seemed like everyone was just chatting with their walking companions. There was a very welcome break about 2/3 of the way through, where we stopped for about 10 minutes and there was refreshments (bread and a local drink called chicha – a kind of fermented drink from corn or sugarcane?). As you can imagine, walking in the sun for 4 hours at a snail’s pace was not, in itself, terribly fun. Despite dutifully applying sunblock before leaving the house, I ended up a few shades darker. (Fun fact: Ned told me that the UV rating for Cuellaje is “extreme”.) But at least now I know that I can survive walking 14 km and in the hot sun to boot! One of the things I’ve missed most since being away from home is baking – I used to try to bake at least once a week, but I stick with almost military precision to the measurements in the recipes I use, down to the last gram (give or take 2 or 3 grams). Rosa, on the other hand, bakes a lot (mostly bread), but in a completely different fashion. She has no weighing scale (that I’m aware of) and does everything by memory, sight and touch. For example, to make savoury bread she uses: 2 spoonfuls of sugar, ¾ spoonful of salt, 3 plates of flour, 3 eggs, and a bit of yeast and hot water – I don’t even know how to quantify it. Although I’ve done my fair share of baking, I’d never attempted bread. I got my first taste of bread-making on the Day of the Dead and it was incredibly fun, albeit tiring. Kneading the dough is quite a workout! This time round, I made two types of bread with Rosa – sweet (empanadas de dulce) and savoury. An alarming amount of sugar went into the sweet bread. 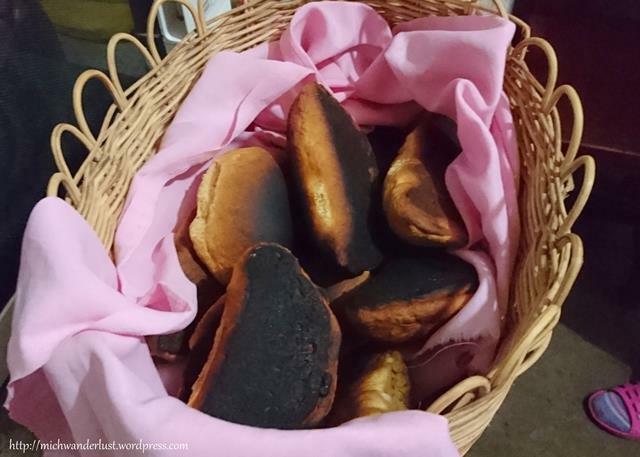 Most unfortunately, the sweet bread got burnt – Rosa was tending to some urgent matter in the fields and while I smelled something coming from the oven, I had no idea what it was so I didn’t know what to do. It tasted fine once you peeled away the burnt bits, though. Thankfully, the savoury bread turned out fine. 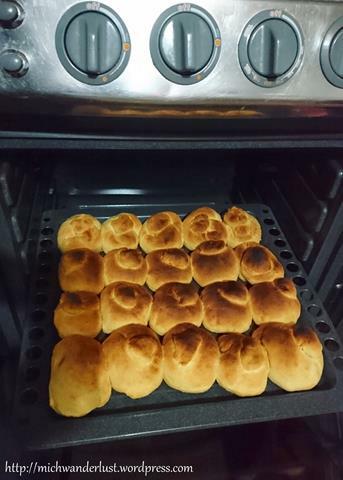 The following week, we made bread again and asados (grilled bread) from the same dough. I consider it a victory when the bread isn’t burnt! We also made torta de dulce (essentially a cake). Again – and this is a common theme – an alarming amount of sugar, but despite that (or rather because of that) it was delicious. 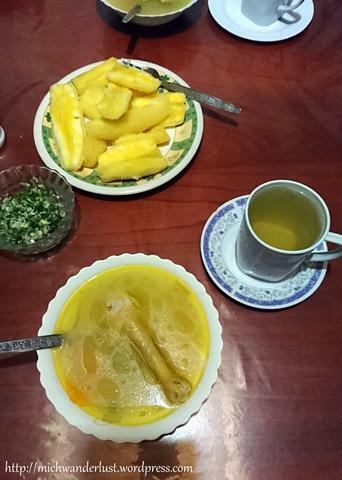 I also helped to make sopa de gallina (chicken soup with rice) – although “helped” might be overstating it since all I did was put the rice and some seasoning in. Again, the amount of salt in the soup is rather alarming. I now understand why it’s so tasty! A few days later, the gas for cooking ran out at breakfast and they had to carry a fresh tank in. It’s a 5-minute walk but those tanks are really heavy. I don’t think I could do it! I’m also getting practice peeling potatoes (with a knife, not a potato peeler – harder than it looks! ), cutting cabbage, etc. 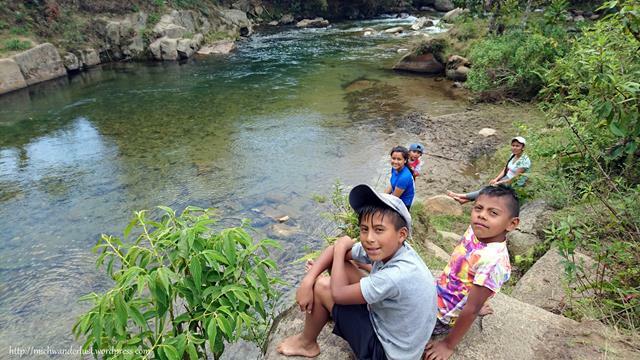 One weekend, Rosa’s sister came to visit with one of her sons and her niece (by marriage) and the kids and I made a trip to the bathing spot in the river that I went to previously with Ned and another volunteer, Scott. It was as scenic as before, but the water was way too cold for a dip. My feet pretty much went numb as soon as I put them in the water. Anthony and his cousin did swim a bit though. These kids are tough! I also had the privilege of attending a dance presentation by the kids. 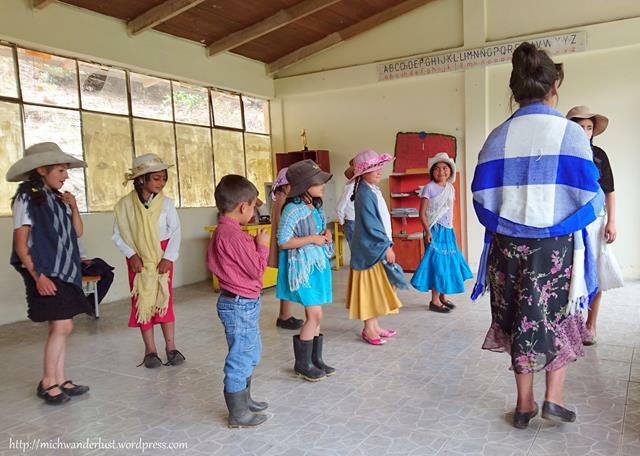 There’s a surprising variety of traditional Ecuadorean music (la bomba, San Juan, pasacalle, to name a few) and the kids present a dance to one of these types of music every couple of weeks. 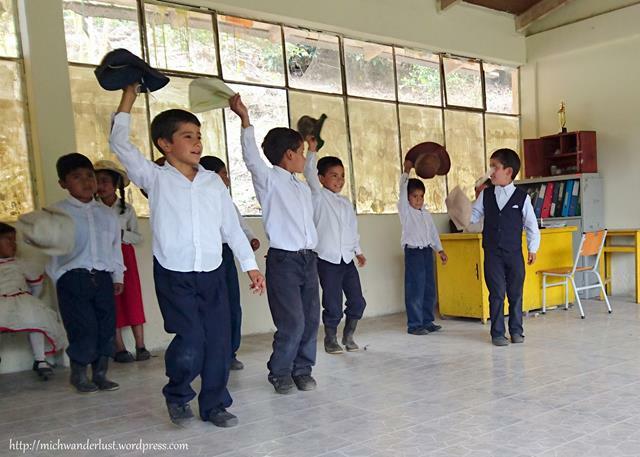 It never fails to amaze me that all Ecuadoreans can dance – and not just one style of dance, but a huge variety! They always tell me that a party isn’t complete without dancing. Coming from a culture where we prefer eating to dancing, this is completely new to me but I think it’s awesome. As usual. I went to help out at Senora Rosa Maria’s place with Ned and Patricia. 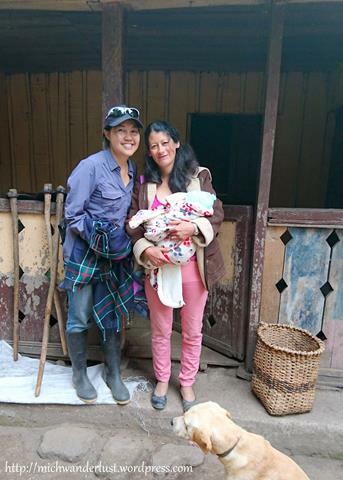 I didn’t expect that Patricia would be there as she’d recently given birth, but there she was – a new mother with a 3- or 4-week-old baby running around as if nothing had happened! 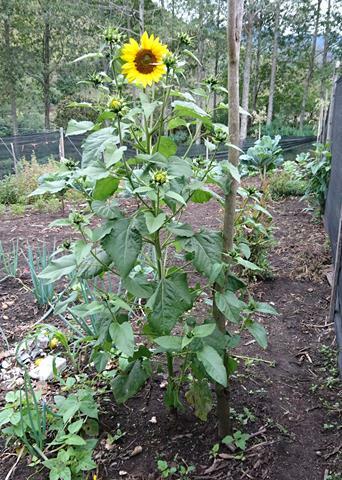 We harvested and peeled some yucas, planted potatoes and did some weeding.